Father James Theby blessed Eli Homyk at the All Abilities Mass at Our Lady of Lourdes Church in Washington. Eli attended the Mass with his parents, Chris, center, and Stacey, right, and his sister Elizabeth. Melissa Brinker came across a video last year in which Pope Francis spoke about the need for the Church to be more inclusive, and she was inspired. Brinker, who teaches seventh and eighth graders at Our Lady of Lourdes School in Washington, said it made her think about children with special needs, and how families navigate those needs and their participation in the Church community. “A lot of families will stop going (to Mass) when it becomes a physical obstacle or fear their child might not behave appropriately or become a distraction to others,” Brinker said. After talking with friends who have children with special needs, Brinker enlisted the help of eighth graders to organize an All Abilities Mass at the parish. Working with pastor Father Jim Theby, the Mass is offered four times during the school year. Eighth graders worked with their pastor to develop specific accommodations, including dim lighting, soft music, seating accommodations for people with physical or sensory needs and a brief homily. Eighth graders help with readings and petitions. The next Mass will be scheduled in the fall, when students are back in school. 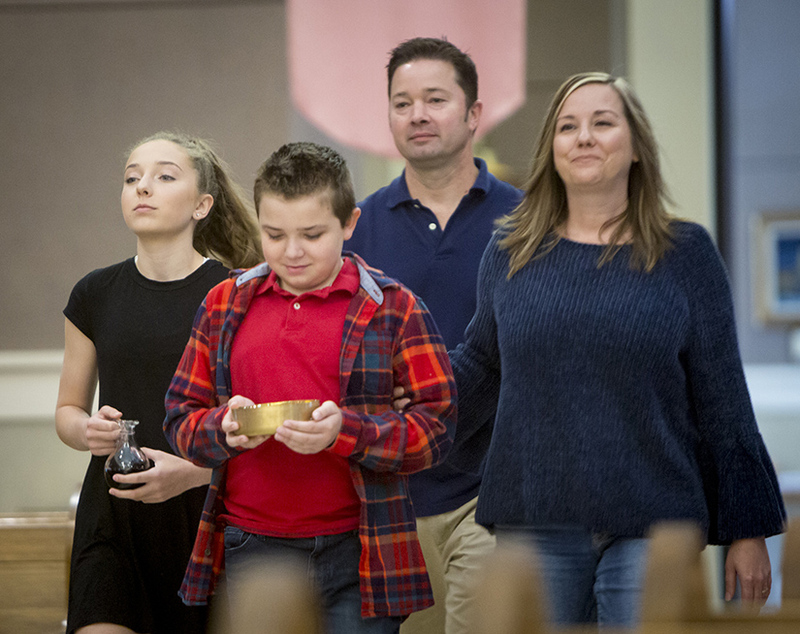 Mike and Michelle Westhoff and their children Maggie, left, and Max, center, brought up the gifts during an All Abilities Mass Sunday at Our Lady of Lourdes parish in Washington. The Mass has also been promoted through All Abilities Athletics, an organization in Washington that provides athletic activities for people with special needs in Franklin County and surrounding areas. Our Lady of Lourdes teacher Laura Vilela, who volunteers with the organization and has a child with special needs, said parents there have been receptive to the Mass. Some have asked how they could start something similar in their own church community. “We want people to know this is about awareness, but also the acceptance of people with special needs,” she said.